What an exciting day! 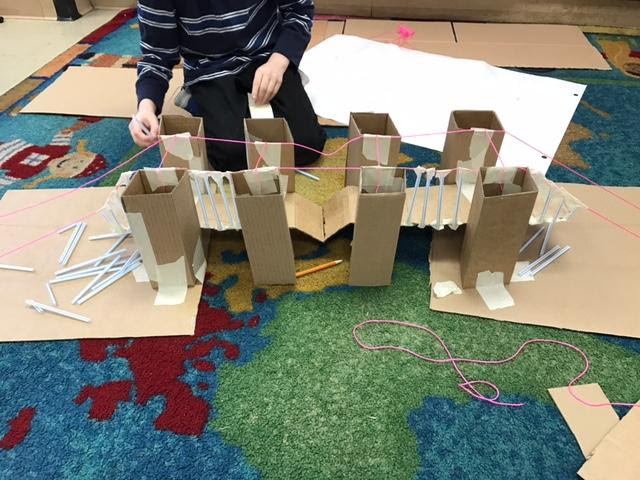 Today we spent the day exploring and discovering all things STEM Science/Technology/Engineering/Math)! The Panthers were given the challenge of making a Wolf Free Island to save all the piggies of the world from the BIG BAD WOLF! 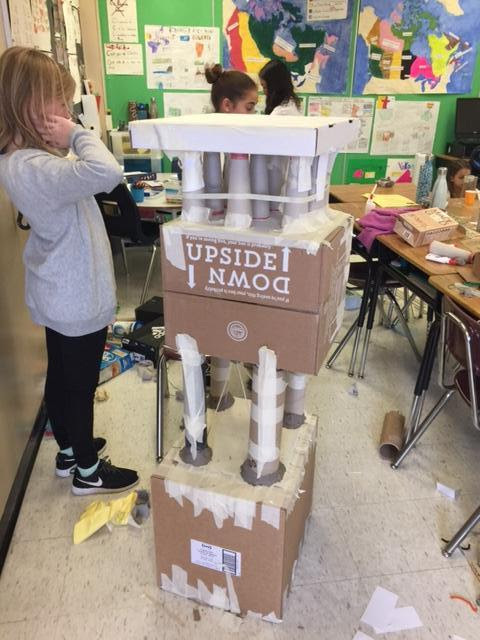 Our Kindergartens built the lookout towers, the Grades 1s and 2s built many homes for the piggies (that could withstand many huffs and puffs), the Grade 3s built drawbridges (to allow the piggies to cross the water, but to ensure that the wolf couldn't cross too), the Grade 4s and some Grade 5s built pulley systems to allow for food transport to the piggies, the Grade 5s built homes that could withstand extreme weather (because you have to be prepared for everything) and the Grade 6s built an alarm that would sound should the wolf try and cross the water! On Wednesday we were treated to an exhilarating, interactive musical performance called Kattam et ses Tamtams. 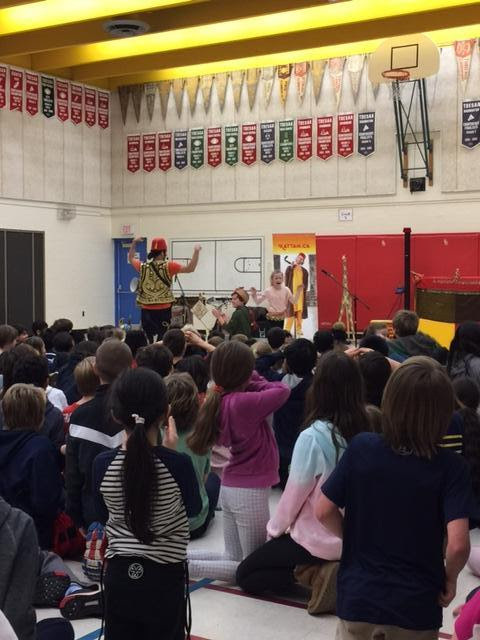 This bilingual performance engaged all students from Grades 1-6 while introducing them to various dances and percussive and modal instruments like the jambes, doumbeks and the zurna. A great time was had by all! 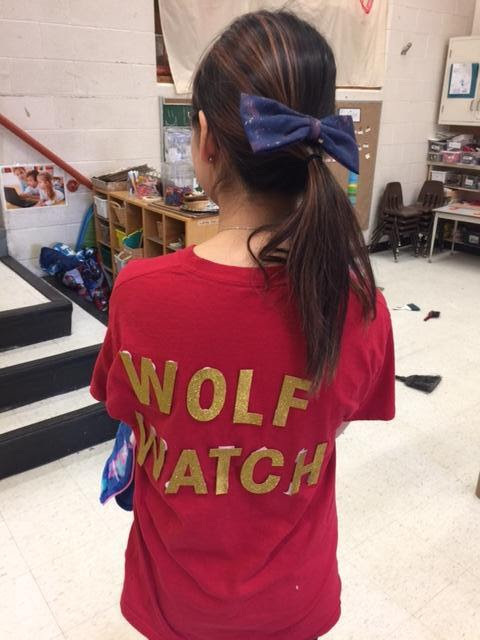 A huge thank you to the Parent Council for supporting this performance! We want to thank all the parents for their unwavering support regarding the Brown School Pool. Parent Council is working very closely with school administration, the TDSB and the City on this very important issue. As soon as more information become available we will let you know. (iv) present a report on (i) to (iii) above to the Program and School Services Committee, for action and completion within school year 2016-17. 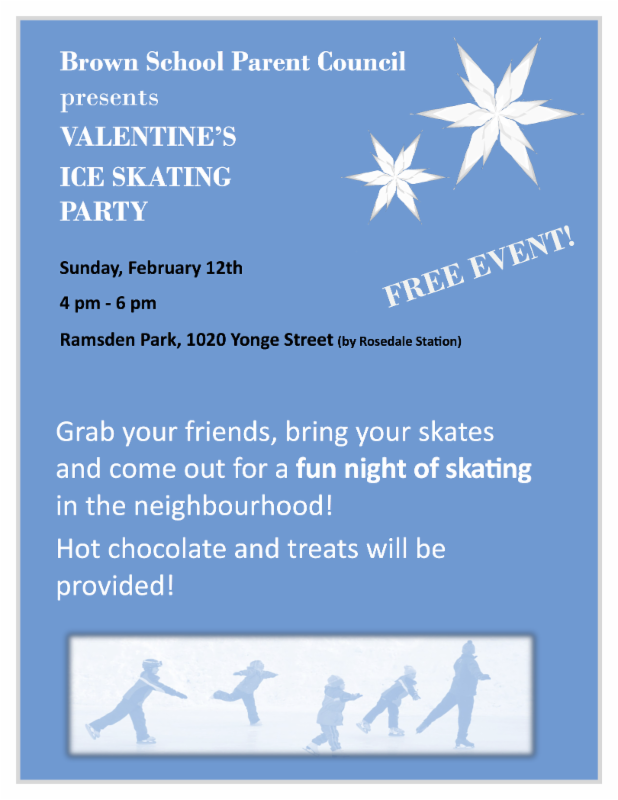 4-6pm, at Ramsden Park 1020 Yonge Street (just by Rosedale subway station). Grab your friends, bring your skates and come out for a fun night of skating in the neighbourhood. Hot chocolate and treats will be provided! This is a free event and everyone is welcome! We have recently purchased 200 new team uniforms for the Cross Country, Baseball, Football, Basketball, Volleyball, Badminton, Frisbee, Soccer and Track teams. 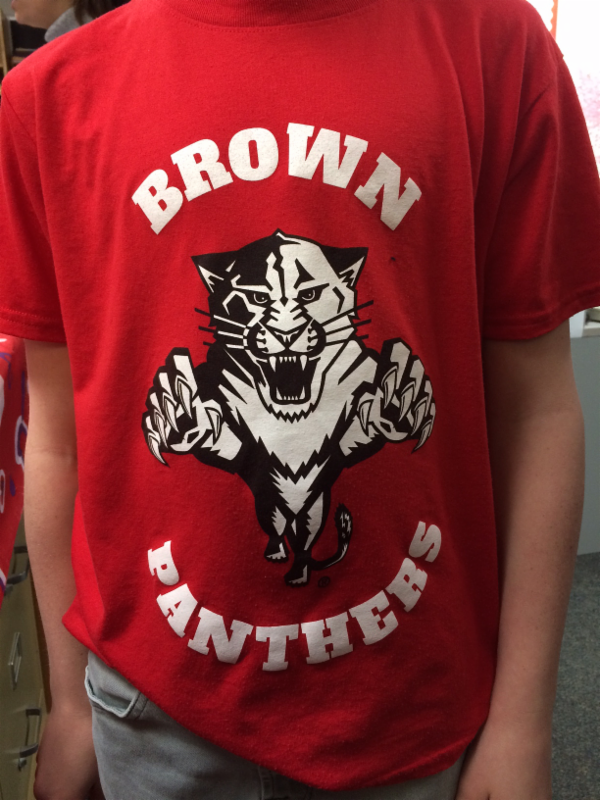 The new performance shirts were funded by Brown School Parent Council. The Parent Council raises the money to provide these services through various fundraising initiatives throughout the year. We thank all Brown School parents for their time and generous donations! Atlantis Swim School runs swim programs at our own Brown School Pool. From bubbles to butterfly, we teach children 4 months and up how to safely swim in small, fun, and dynamic classes, and evaluate them using the criteria put forth from the Red Cross swimming program. Since 1986, our classes have taught children the essentials of swimming, how to stay safe in and around water, advanced techniques for competing or eventual life guarding, and everything in between. Atlantis and Pedalheads is hosting a Free Swim every Saturday from 11:00am to 1:00pm for children of any age! Parents are welcome to enjoy the free swim with their child as well. We will have life guards and highly qualified instructors on site during the free swim as well. Come out and enjoy a free swim on us! Calling all Grandparents, Retirees, or anyone interested! Toronto Police Service School Crossing Guard Association is looking to hire school crossing guards! This is a gentle reminder that Kiss & Ride is a drop off zone, on Poplar Plains Road, for students grades 1-6 only. Kindergarten children must be walked to their classrooms. This program is staffed completely by Brown parent volunteers, from 8:25-8:40am. There is no parking in the designated Kiss & Ride drop off area, or in the school bus zone between 8:25am and 8:40am for ANY reason. When using Kiss & Ride, drivers must stay in the vehicle; volunteers will open the doors for your child(ren) on the passenger side of the car. If you must enter the schoolyard or your child is not able to walk in alone you need to park on one of the side streets where parking is permitted. Parking in the Kiss'n'Ride zone is NOT permitted. For safety reasons, the Avenue Road Driveway is only to be used by TDSB Facilities staff, and Brown Administration. Please note that the parking lot off Poplar Plains is for Brown School Staff only. Our program relies on volunteers. Please be courteous with our Kiss & Ride volunteers!